Time for the Lege to pay a few past-due bills from 2011. That’s where a supplemental budget comes in. It is literally a second budget added to the original one lawmakers approved in 2011. It’s not an unusual course for lawmakers to take to address lingering IOUs, but this year’s efforts are becoming more complicated and politically fraught than in the past. For starters, lawmakers are planning at least three bills to address the state’s supplemental needs instead of the usual one. The first measure needs to be signed by Gov. Rick Perry in March so the state can pay billions in upcoming health care bills on time. A second supplemental bill will address the state’s costs from fighting wildfires and providing prisoner health care, but it won’t need to pass so quickly. A third measure, also not a rush item, will reverse $1.75 billion in delayed funds to school districts. State Rep. Jim Pitts, R-Waxahachie, chairman of the House Appropriations Committee, said separate bills were needed to ensure that the emergency item makes it to Perry’s desk quickly. 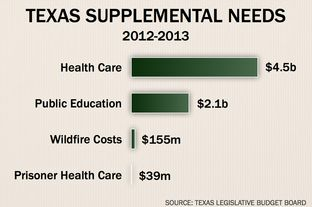 Texas has $6.8 billion of unmet costs in the current budget, nearly all of it related to Medicaid and public education, according to the Legislative Budget Board. Lawmakers plan to use most of the extra $8.8 billion the Texas comptroller reported collecting from this biennium to pay those costs. One way of thinking about this is that if Comptroller Combs had given us an accurate revenue estimate in the first place, we we could have dealt with all this in 2011 instead of pretending it didn’t exist for the purposes of “balancing” the budget. This is also a reminder, once again, that the concept of “balancing” the budget as we do in Texas is a fiction imposed by an artificial deadline. The House Appropriations Committee passed its first supplemental bill on Monday, and Pitts plans to bring it to the House floor for a vote early next week. The bill, House Bill 10, has “emergency” status, a parliamentary designation that allows legislators to vote on the measure during the first 60 days of the session if Pitts can get the support of 120 of the 150 House members. “It’s the first time I’ve ever had an emergency supplemental,” Pitts said. The emergency stems from the last Legislature’s decision to fund Medicaid and the Children’s Health Insurance Program for only 18 out of 24 months in the budget cycle, a move that allowed lawmakers to delay $4.5 billion in spending from state coffers. HB 10 will fund those programs for the full two years with $4.5 billion in state money, which will automatically trigger an extra $6.6 billion in federal funding. The bill needs to get to Perry’s desk by early March so that health care workers aren’t left in the lurch, Pitts said. “If we do not pass House Bill 10 for Medicaid, the doctors, the hospitals, the nursing homes will not be paid after the middle of March. … That is the emergency,” Pitts told his colleagues on the House floor Monday. The bill also includes $630 million owed to schools districts. The emergency is one part the result of Combs’ inaccurate revenue projection, and one part the Republicans’ fanatical refusal to find new revenue. Most likely, these bills (about which you can learn more here) will pass, but you never know what the bomb-throwers in the GOP caucus might try to do. You may be wondering about the issue of school finance, for which Democrats have tried to get the cuts from 2011 restored. That’s not going to happen, but some kind of partial restoration may be possible. House Appropriations Chairman Jim Pitts, R-Waxahachie, said that lawmakers have just under $1 billion available to spend without hitting the constitutional spending limit on the current two-year budget. He and a group of lawmakers, which includes House Speaker Joe Straus, R-San Antonio, are in talks to add some of that money to a supplemental spending bill expected to reach the full House next month. “We’re still working on it,” Pitts said Thursday. State Rep. Donna Howard, D-Austin, said the discussions are looking at adding public education money both to the current budget and the next two-year budget cycle. During debate over the rule, Pitts told lawmakers the second supplemental bill may include funding for public education. That bill is also expected to address unexpected costs related to recent wildfires and prisoner healthcare. State Rep. Mark Strama, D-Austin, urged Pitts to make clear publicly as soon as he could how much more money school districts could expect so they could properly plan to use it before the end of the fiscal year. He said many districts might use some of the funding to hire tutors for students who need to retake the STAAR end-of-course exams. “There is time for us to make a meaningful difference in the resources available to them,” Strama said. The rule in question was one that forbade any amendment to HB10 that added to the total cost without any offsetting cut elsewhere. We’ll see what comes of this. EoW has more.